I found an interesting study of local election data from California State University, Sacramento. According to the CSUS study, in an average year in California, there are 16 local recalls, of which 66% result in the officeholder being recalled from office. Specifically, there are 2 county-level recalls, 7 city-level recalls, and 7 school district-level recalls in an average year. Outside the timeframe of the study, 9 out of 9 city councilmembers subject to recall elections were recalled in 2011. This bumps city-level recalls to a 71% removal rate for 1995-2011. 4 out of 4 school board members defeated their recall elections in 2011, dropping the school district-level recalls to a 60% removal rate for 1995-2011. There were no county-level recalls that qualified for the ballot in California in 2011. The overall rate for all local California recalls for 1995-2011 remains at 68%, the same rate as for 1995-2010. The above numbers are statewide. 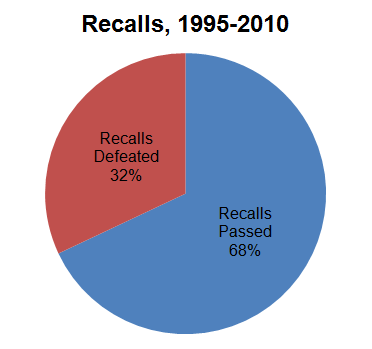 Looking closer to home, no Orange County recall has failed since 1996. Mike Winsten was recalled 61.4%-38.6% and replaced with John Alpay. Ken Maddox was recalled 61.3%-38.7% and replaced with Gary Pritchard. Lance McLean was recalled by a 50.1%-49.9% and replaced with Dave Leckness. Marlene Draper was recalled 69.3%-30.7% and replaced with Sue Palazzo. Sheila Benecke was recalled 69.4%-30.6% and replaced with Ken Maddox, who would ironically be recalled himself in 2010. Nativo Lopez was recalled 69.3%-30.7% and replaced with Rob Richardson. Martin Jacobson was recalled 51.5%-48.5% and replaced with Melissa Taylor Smith. Maureen Aschoff was recalled 50.9%-49.1% and replaced with John Ortega. Linda Davis was recalled 51.3%-48.7% and replaced with Kathy Moffat. Karen Lloreda defeated a recall effort by a 50.6%-49.4% margin. Harold Kaufman defeated a recall effort. Cecilia Age, Gail Kerry, and Walter Bowman defeated their recalls by a 2-1 margin. Assemblywoman Doris Allen was recalled 65.2%-34.8% and replaced with Scott Baugh. In 1994, the voters of Fullerton recalled Councilmembers Don Bankhead, Buck Catlin, and Molly McClanahan, by 52%-48% margins but left the then-elected City Clerk Anne York in office. Five months after the recall, Bankhead won a new election to the council where he has remained ever since and is now subject to a recall election next week. If recalled next week, Bankhead would likely be the first person since the inception of the recall ever to be recalled from the same office twice. In 1989, the voters of Fountain Valley recalled Councilman Fred Voss by a 2-1 margin after he pleaded guilty to a misdemeanor for solicitation after he offered $20 to a prostitute, who was actually an undercover police officer.